Where do nodules come from? What to do in case of hoarseness? What are the effects of alcohol of smoking and what procedures does a doctor use to heal vocal trauma? If you love to sing it can be very helpful to know a little about vocal health and what is called ‘vocal hygiene’. 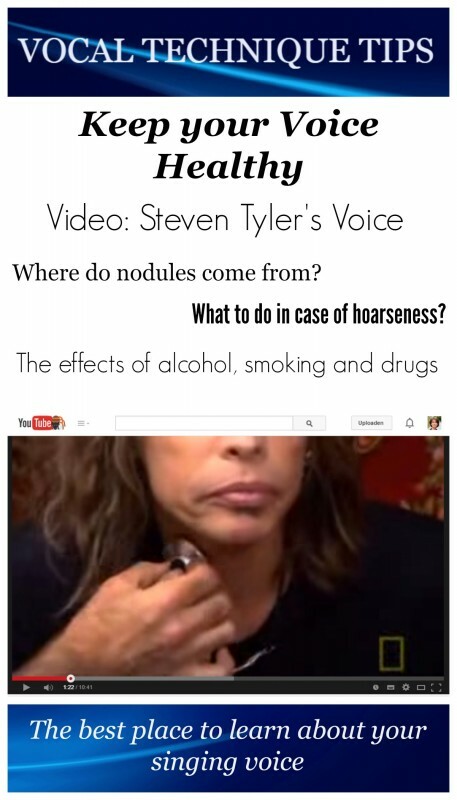 In this video fragment of National Geographic’s film Incredible Human Machine, rock singer Steven Tyler is being monitored by a research team from Massachusetts General Hospital. Months before, Steven Tyler was unable to sing because of a ‘vocal bleed’. Finding the vocal techniques suitable for pop/rock, musical theatre, etc. can be difficult. Many voice teachers are still searching for the right tools to help their students singing contemporary music in a healthy way. EVTS and CVT are methods that work with contemporary song as well. The Shenandoah Conservatory is working on a programm to promote the use of a healthy technique in contemporary music, such as pop/rock, R&B, etc.